Modifications are numerous and include the adding of an air-ride suspension, modifying the truck's new V-8 engine, and preparing it for its new electrical and colling system. The crew has shortened the truck's bed, and altered its stance while preparing the body for paint, which the students will apply. This project, which has spanned over a 3-5 year period, has gotten a fresh burst of energy. Both CVCC students and staff members stay after school to work on the truck, giving their time and working full throttle to complete it. Much is being taught through this project, including fabrication, welding, measuring, and painting. The learning goes beyond the mechanics though, through the use of team analytic skills, building, working with others, and collaborating amongst programs. It is clear that both hard and soft skills are being taught. Real, hands-on work and life skills are bing gained by all involved! Though this project has been in the works for quite some time, the hope is for it to be completed by the end of the current school year. The goal is for the truck to be finished in time to be displayed at the Piston Power Show, which is held in March at the IX Center. The ultimate endgame of this project is, of course, for students to learn, but also to resell the vehicle there to raise scholarship money for students. CVCC students and staff are not the only ones involved in this project, as they are in collaboration with the Career and Technical School Foundation, a foundation that has given an incredible $150,000 in scholarships to CVCC students over the years. CVCC staff members donate both time and money to this foundation, which Gerry Gonda explains is a, "blue-collar, self-funded foundation, whose objective is to help students learn career and life skills." Gerry is one of the founders of the Career and Technical School Foundation, and is a frequent substitute teacher at Cuyahoga Valley Career Center. The ultimate goal through the Career and Technical School Foundation is to give back to society. Through much group effort, the Career and Technical School Foundation sponsors events like the Motor Sports and More auction, which raises scholarship money for many CVCC students, and Wheels to Prosper, and effort that CVCC's Auto programs were also involved with which helped a person in need gain use of a car. This foundation could not be possible without the great efforts that its members, which includes CVCC staff, put forward. CVCC is abundantly grateful for all the good the Career and Technical School Foundation brings our students and community. 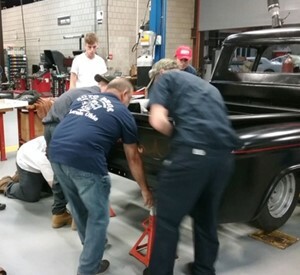 The projects and efforts of rebuilding a truck, as well as the many other projects that CVCC Auto students get to be a part of, would not be possible without the help of local business partners and sponsorships. CVCC's Auto Service Technology and Auto Body Repair and Refinishing programs thank Rural Trucking, D&S color Supply, Summit Racing Equipment, Flaming River, Parma Transmission, and Arendas Insurance. These businesses do everything from supplying resources, to employing CVCC students and alumni. What incredible work by CVCC students, staff, as well as local foundations, businesses, and community members! This teamwork is what fuels the great learning that makes CVCC the place it is today!